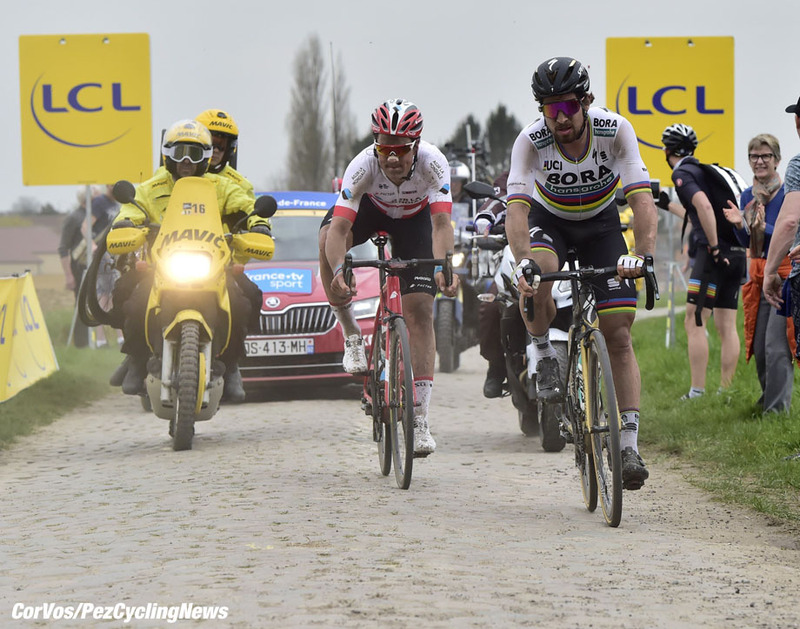 PezCycling News - What's Cool In Road Cycling : 2018 Paris-Roubaix Hero: Silvan Dillier Talks Cobbles! 2018 Paris-Roubaix Hero: Silvan Dillier Talks Cobbles! 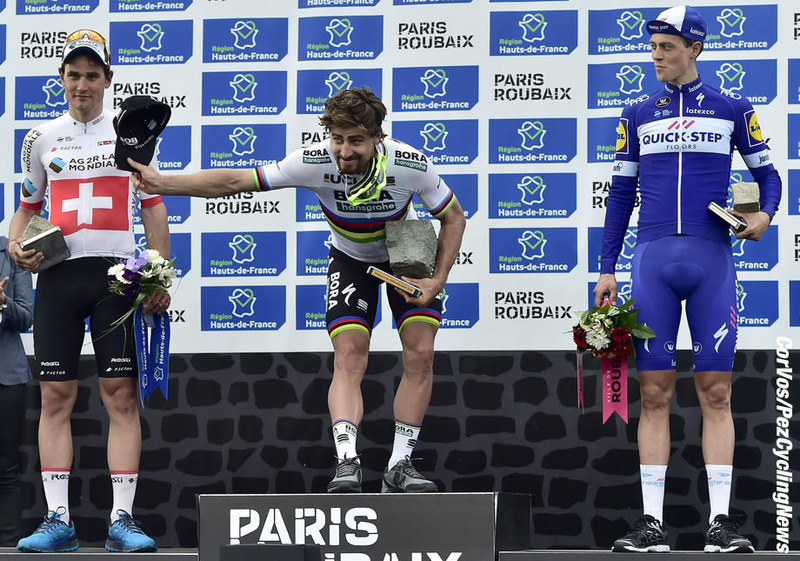 Rider Interview: World champion Peter Sagan won the 2018 Paris-Roubaix, but the hero of the day was undoubtably Silvan Dillier. 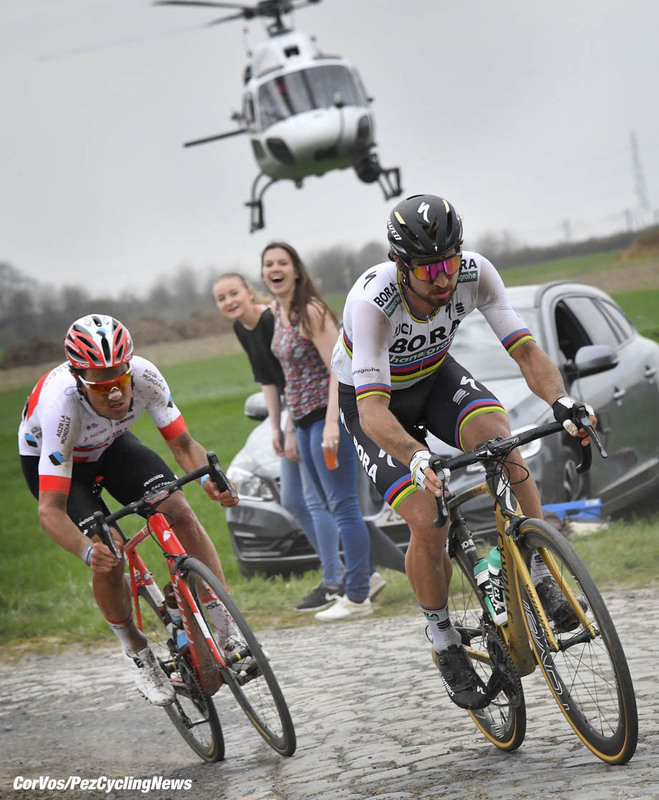 The Swiss rider was in the break of the day and was the only rider to go with Sagan through the Hell of the North to the Roubaix velodrome. Ed Hood managed to have words with Silvan. 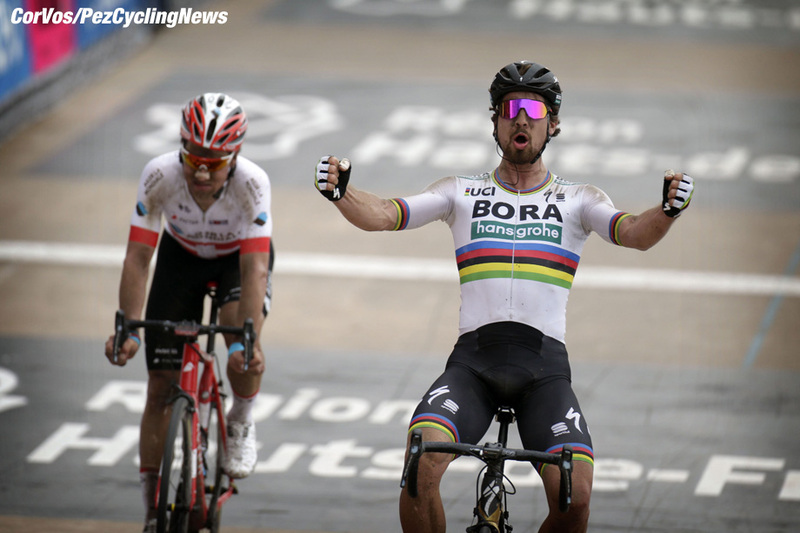 Peter Sagan was the brilliant winner of Paris – Roubaix 2018 but ‘Man of the Match’ award must go to Swiss Elite Road Race Champion, Silvan Dillier (AG2R) who finished second after being ‘up the road’ for much of the day. We first knew him as a time trial and track rider, winning national junior and U23 titles in the time trial, omnium and madison before graduating to win the European U23 madison in 2011. He defended that title a year later and added the European U23 individual pursuit title. That same year there was a Tour de L’Avenir stage win and a podium in the Gent Six Day partnering the legend that was ‘Big Bob’ Bartko. In 2013 he took the Tour of Normandie overall and as a BMC stagiaire with the ‘big guys’ won a stage in the Tour of Alberta. One year later he was World TTT champion in Ponferrada with Oss, Quinziato & Co. Season 2015 saw that title defended in the United States, the National Elite TT title, a stage in the Arctic Tour and a Giro ride. The year 2016 saw him ride his first Vuelta; whilst the start of season 2017 had him second in Dwars door West-Vlaanderen and eighth in the Brabantse Pijl prior to his brilliant Stage Six win in the Giro then overall victory in the notoriously tough Route du Sud stage race in France which included the mighty Tourmalet – and the Swiss Elite Road Race title. The 2018 season produced early top 20 finishes in Het Nieuwsblad and the Trofeo Laigueglia; but a broken finger sustained in the Strade Bianche was an unwelcome distraction before he bounced back to win the Route Adelie de Vitre, a tough counter for the hotly contested Coupe de France series. 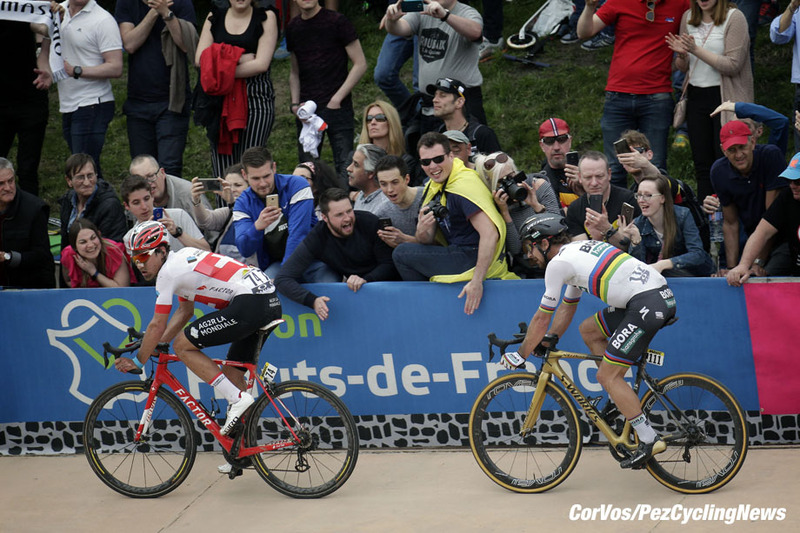 When we saw him go with the break of the day around an hour into the Queen of the Classics, well before the first pave, little did we know that he’d be the first man on to the velodrome in Roubaix. 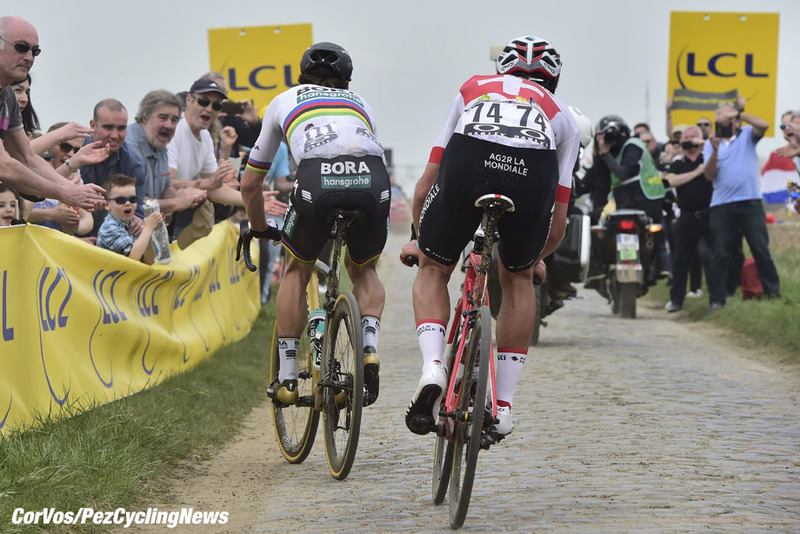 . .
PEZ: 2018 Roubaix was a tremendous ride – but how did you feel on Monday morning? Silvan Dillier: Tired! It’s a tough race, it uses up your body; it’s different from a normal race where your legs are a little sore next day but your body is fine – after Roubaix my legs were fine, but my body was shattered! PEZ: What was in your mind when you headed off up the road at the end of the first hour of racing? It was part of our original team plan that I should go in the break in the first hour and from there on try to survive as long as I could. I wasn’t thinking long term, just about the next kilometer and then the next – and the next secteur. PEZ: What did you think when Sagan arrived? As I said at the finish, he’s an angel and the devil in one person. In the breakaway he has a big engine, he takes his pulls and doesn’t mess around – we worked well together and I realized that I could make the podium. But when you’re trying to win then he’s the devil on the velodrome – so strong, so hard to beat. PEZ: We saw you exchange words. . .
We agreed that he’d do the pulls on the cobbles and set a steady tempo and we’d share the workload on the tarmac sections. PEZ: Did you have any nervous moments? No, not really, I tried to keep relaxed, fortunately I didn’t have any mechanical issues or punctures and got great support from my team car. They kept me up to date on the race situation, when the next secteur was coming up, how long it was and if we had any personnel located on the exit of the secteur with bidons, gels and spare wheels. 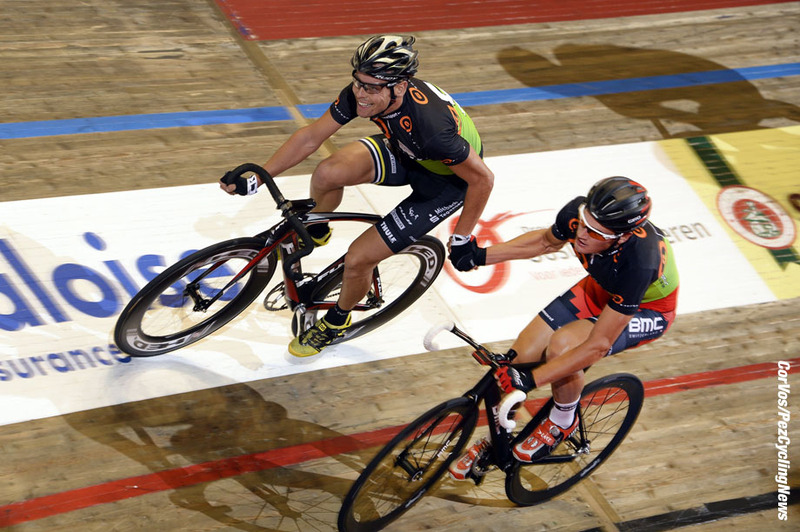 PEZ: It must have been special to be first man to enter the velodrome? Sure, I was aware of all the people – and being first guy onto the velodrome was really special but I was thinking about how to beat Sagan rather than anything else. I was a little worried about all those flags though, I didn’t want to get tangled in one and crash! PEZ: If you could ride the race again, is there anything you would do differently? I’ve been asked that question many times – afterwards I watched the race videos and can’t find any point where I’d do anything differently. I have no regrets, I’m happy that I rode a near perfect race – the only thing I couldn’t do was beat Sagan in the sprint. PEZ: What about the famous showers? I didn’t get to sample them, unfortunately. There was so much to do with the media demands, ‘selfies’ and doping controle – and the team were waiting for me on the bus so we could all have a beer together. So my shower was on the team bus. PEZ: Did the Swiss Media make a fuss about your ride? 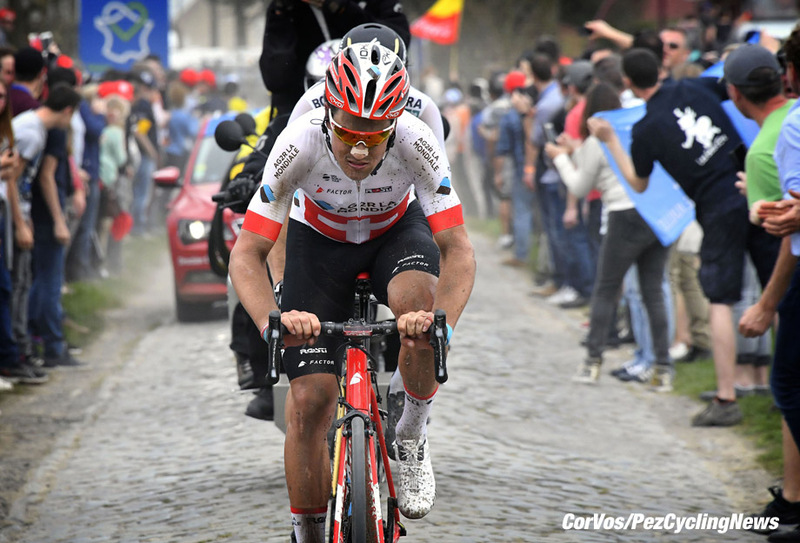 Yes, I got big coverage, it’s nice – but of course they’re always looking out for, ‘the next Fabian Cancellara.’ Of all the monuments, Paris-Roubaix is best known in Switzerland due to Fabian’s three wins in the event – it’s a big deal race at home. PEZ: Did Fabian get in touch to congratulate you? Yes, that was very nice – and I actually spoke to him before the race, he gave me advice on which tires to ride and what pressures to run. It was good to get advice from the big champion, it all adds to the special occasion. PEZ: We saw your shape was good with your win in the Route Adelie de Vitre. I knew I was in good shape but didn’t actually expect to win – so that was nice. PEZ: Those French Cups are tough races, aren’t they? People think that French Cups are just small races and easy to win but that’s not the case – they’re a very different kind of race. In professional racing everyone has a role in a race, there’s a plan, a strategy; go with the early break, cover the late breaks, bring the break back, lead the sprint out – every race is controlled. In the Coupes de France it’s not like that at all, just attacks! bim! bam! bang! It’s more like an amateur race, no control and you need to read the race and find your own way. 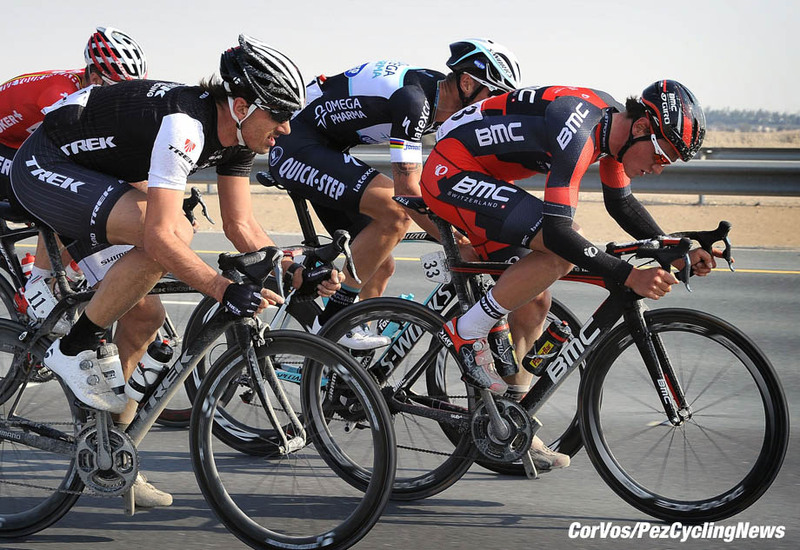 PEZ: You seem very happy at AG2R-La Mondiale, how does it compare to your previous team, BMC? 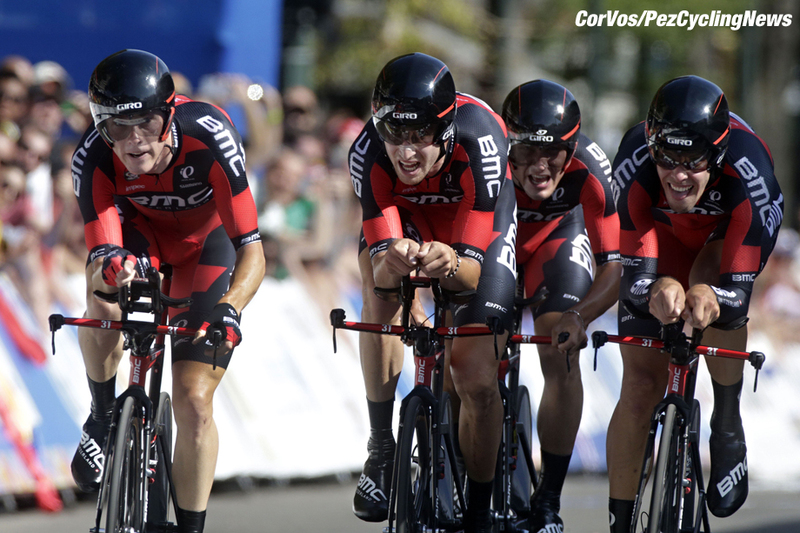 BMC was a real ‘performance’ team; ‘how can we win? we have to win!’ AG2R has more of a family feel; we all know we have to do our best for our sponsors but as long as everyone does there best then we’re happy. Our objective at Roubaix was to put a rider in the top five; obviously we were all delighted that I finished second but if I’d been fifth then the team would still have been happy. Whilst it’s a new team for me, back in 2010 as an U23 I rode for Chambery Cyclisme Formation which was sponsored by AG2R-La Mondiale so I knew a couple of the guys from back then, Romain Bardet and Axel Domont were team mates. PEZ: I first got to know you as a six day rider. . . Yes, but for the next few years I don’t think you’ll see me in the sixes – my road program is so tough. I look forward to my winter off and I also like to build up to my road season properly. 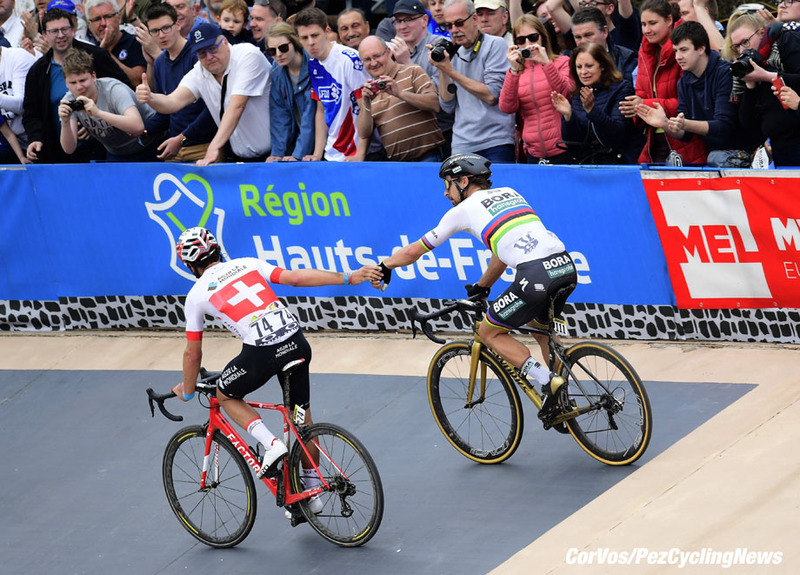 PEZ: Final question on Paris-Roubaix; you must now believe you can come back and win? Sure! I was so close - if I train that little bit more and harder, I think that it’s possible. Next step up in 2019?